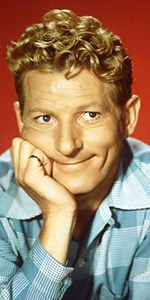 Danny Kaye was One of the most popular entertainers in the post World Warr II generation. With his flaming red hair and his comic skills and ability to handle songs with incredible dexterity, Kaye was popular everywhere: stage, screen, television, radio, records, public appearances, young, old — you name it. David Daniel was born to a Ukranian Jewish immigrant father, mother and two brothers, who had arrived in Brooklyn in 1909. David Daniel was born in the U.S. Attending PS 149, he grew popular with his classmates with his entertaining hijinx. David attended Thomas Jefferson High in Brooklyn; his mother died when he was 14 or so, allowing him to run away to Florida with his friend Louis. They played and sang together for their supper. Upon returning home, David's father allowed his youngest son to find his own level in his own time. Wanting to become a surgeon, the family could not afford the schooling required. Working odd jobs led to him working (as "Danny Kolbin") as an MC at a resort in the Catskills. "Danny Kaye" broke into vaudeville with a dance act in 1933, opening in Utica, New York. After touring the U.S., Kaye found himself having to entertain a worried audience during a typhoon in Osaka, Japan. Working in foreign counties forced Kaye to entertain in mime, and soon, he became very adept in this artform. Kaye spent a while working for burlesque dancer Sally Rand. He signed up with New York-based Educational Pictures to make short films with fellow newcomers. His first was Dime a Dance (released in December, 1937), with Imogene Coca. Kaye made his Broadway debut in Sylvia Fine's musical revue The Straw Hat Revue for 75 perfs, from September to December, 1939. Kaye and Fine would marry in 1940. Dancer Jerome Robbins and Imogene Coca were in this show as well. Soon after, Kaye and Fine were playing at a Manhattan nightclub called La Martinique, where Moss Hart saw Kaye and started thinking Kaye would be good for a show he was workiing on. Kaye was cast as a fashion photographer opposite Gertrude Lawrence, playing a fashion magazine editor, in the Kurt Weill / Ira Gershwin / Moss Hart musical Lady in the Dark for 467 perfs, from January, 1941, to May, 1942. Kaye's singing of the tongue-twisting song "Tschaikowsky (and Other Russians)" was a show-stopper which made him a star. Kaye was now a hot property. He was cast in the lead of a new Cole Porter musical Let's Face It! for 547 perfs, from October, 1941, to March, 1943. His co-stars were Eve Arden, Vivian Vance and Nanette Fabray. Producer Sam Goldwyn won the right to produce Danny Kaye's first feature Up in Arms (released in February, 1944), with Dinah Shore and Dana Andrews. The film became a huge hit, paving the way for The Danny Kaye Show, airing over CBS Radio from January, 1945, to May, 1946. Kaye's next feature film was Wonder Man (released in June, 1945), with Virginia Mayo. Because of his having appeared in Japan before World War II, Kaye made appearances there with the USO just after V-J Day, in October, 1945. Returning from Japan, Kaye starred again with Virginia Mayo in The Kid from Brooklyn (released in March, 1946); other Kaye hits for Goldwyn include The Secret Life of Walter Mitty (released in September, 1947), with Virginia Mayo, and A Song Is Born (released in October, 1948), with — Virginia Mayo! Kaye made a successful engagement at the London Palladium (attended by the Royal Family) in 1948. When his initial Goldwyn contract ran out, Kaye experimented with working at other studios. At Warner Bros' he made The Inspector General (released in December, 1949), with Walter Slezak. Warners allowed Kaye to take a break from filming in order to return to England to appear in the Royal Variety Performance at the London Palladium in November, 1948, King George VI was said to be quite a fan. After finishing Inspector, Kaye went over to 20th Century-Fox and did On the Riviera (which played the Chinese in May, 1951) with Gene Tierney. Kaye returned to Goldwyn for what has to be considered his signature role, playing the title role in Hans Christian Andersen (released in November, 1952). Kaye made hits out of all the Frank Loesser songs in the film, such as "The Inch Worm," "I'm Hans Christian Andersen," "Thumbelina," and "The Ugly Duckling." Paramount teamed Kaye with Bing Crosby for the ultra-popular musical White Christmas (released in October, 1954), then made The Court Jester (released in January, 1956), with Glynis Johns. Danny Kaye was involved in so many things during this period, it is hard to keep track of them all. A documentary about Kaye's work as a UNICEF Ambassador, Danny Kaye als Unicef Sonderbotschafter, was aired over Germany's NWDR network, in December, 1956. Kaye founded a production company and produced The Five Pennies (released in August, 1959), with Barbara Bel Geddes, and The Man from the Diners' Club (released in April, 1963), with Cara Williams. The Danny Kaye Show ran for 123 episodes, aired over CBS from September, 1963, to April, 1967. He took on a supporting role in The Madwoman of Chaillot (released in October, 1969), with Katherine Hepburn, and returned to Broadway to play Noah in the Richard Rogers' musical Two By Two, from October, 1970, to February, 1971; a torn ligament in his leg didn't slow Kaye down — he played his role in a wheelchair! He played Geppetto to Sandy Duncan's Pinocchio aired over CBS, in March, 1976, and played both Captain Hook and Mr. Darling in Peter Pan aired over NBC, in December, 1976, with Mia Farrow in the title role. Switching gears, he played a Holocaust survivor in the television movie Skokie aired over CBS, in November, 1981. His final recorded performance was as a dentist on an episode of The Cosby Show aired over NBC, in February, 1986. Kaye had undergone quadruple bypass heart surgery in 1983. During his hospital stay he was infected with hepatitus C from a blood transfusion; he died of heart failure in March, 1987 at the age of 76. Grauman's Chinese Theatre, Hollywood, California. Danny Kaye Forecourt ceremony, Sunday, October 19, 1969. A wealth of people help Mr. Kaye make his footprint into the cement.